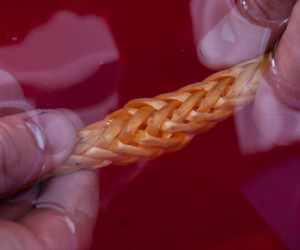 Like every item on a vehicle, synthetic ropes have to be maintained in order for them to retain their strength and function properly. Taking the proper precautions while winching and performing regular maintenance on your ropes will keep them working for a long time. When setting up a winching recovery with synthetic winch lines, it is critical to take the time to properly set up the rigging. Make sure that winch line will not be in contact with any sharp edges once taught, as this can severely damage the line and potentially lead to rope failure. 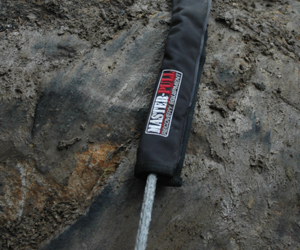 If it is impossible to avoid contact with an abrasive surface, use a chafe guard, such as the Master Pull rock guard. This will keep the rope from getting cut while winching. With use a winch line will start to get a "fuzzy" appearance. This is normal but if the strands start to show signs of too much abrasion the winch line needs to be fixed or replaced. 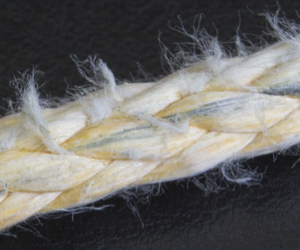 Closeup of a cut strand. It is a good idea to check the entire rope for wear and re spool it neatly after every use. Check the winch rope for any cut strands, fraying parts, abrasion, or heat damage from the winch. After use, all winch lines will get a little "fuzzy" from abrasion. This is normal, but if an entire strand is cut the winch line needs to be replaced or fixed. 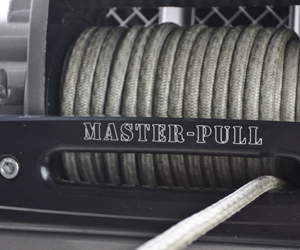 For the winch line to work properly and maintain its strength, all 12 strands must be intact. 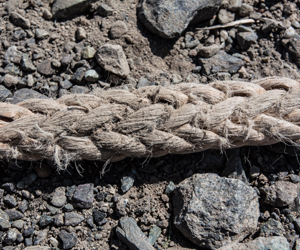 This winch line has sand and grit lodged between the fibers which can damage the rope. Some time spent cleaning will help prevent the winch line from getting damaged. Fill a bucket with water and mild soap and run the winch line through the water. While running the rope throught the water, push together on the rope and open up the braid. This will help loosen dirt and grit from the fibers. Continue running the winch line through the water until the entire length of the line has been cleaned. 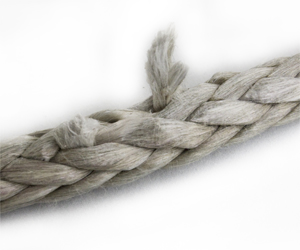 Open weave 12 strand winch ropes such as our Basic series are vulnerable to having dirt and grit damage the fibers. When dirt and grit become lodged in between the strands of the winch line they cause abrasion to the fibers when the winch line is put under a load. Overtime this can cause a breakdown in the integrity and strength of the rope. To help prevent this and slow down abrasion, it is a good idea to wash your winch rope after it gets dirty. 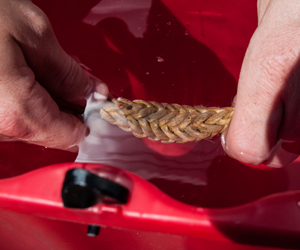 There are a few ways to wash a synthetic winch line. Before cleaning, it is best to first unspool the entire line from the winch and lay it on a surface that is relatively clean. (There is no use trying to wash it on sand or gravel!) Once the line is laid out, rinse it well with water from a hose. 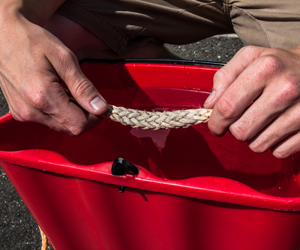 To really get the strands free of dirt and grit, it is best to fill a bucket with water and some mild soap and run the entire length of the winch line through the water. While running the line through the water, push together on the rope to open up the strands to free dirt and grit. Note: Do not wash your rope in a washing machine because the strands can get caught and pulled out.